TAGUCB state-of-art campus is designed to assure that the university social and academic experience influences, challenges, empowers, supports and prepares students to live in, work in, and value our increasingly global and diverse world. The building has been structured with high quality insulation, glass, central air conditioning, lighting, electrical systems and interior finishing. The size and number of rooms, halls, offices, toilets and other facilities such as furniture, equipment etc. has been carefully calculated to be satisfactory to the number of present and future institute foot movement; and comply with High Educational Council requirements and applied standards. 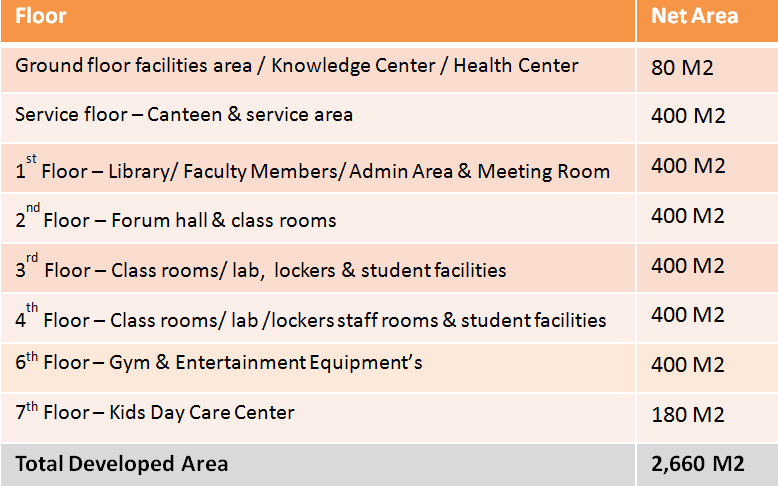 The main building has six floors incorporating classrooms, auditorium, meeting rooms, administrative and faculty offices, cafeteria and a library, with areas specified in below table. Our educational environment reflects the dynamicity of business environment. TAGUCB has responded to the development of technology by designing state-of-the-art classrooms and laboratories equipped with the latest technological tools. Our classrooms are tiered to provide an unobstructed contact with the instructor. All classrooms are equipped with computer projectors mounted in the ceiling and padded swivel chairs for the comfort of the students. Audio-visual language centers are designed to allow students to learn languages by listening to correct statements and pronunciations and then recording and listening to their own pronunciation. This facility is designed with individual booths for the students, each equipped with the necessary hardware. Video conference center allows live and direct discussions with lecturers, students and guest speakers wherever they may be located. TAGUCB’s library houses many volumes of reference material and is equipped with computers that have an access to international libraries through memberships that are available for free to the faculty and students. Lockers are available for students. As the curriculum is phased in and as the number of students grows, TAGUCB will expand into much larger facilities.